Well, my backup – office anyway. 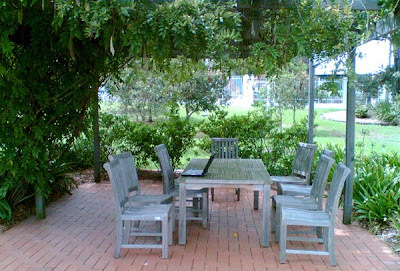 Wi-Fi coverage at work has been extended to cover most outdoor areas, including the vast lawns between the office buildings. So whenever the sterile air-conditioned blandness of my usual crime scene domain gets too sticky, this shall be my refuge. A good idea! We do have Wi-Fi coverage here as well but what we don't have is a garden.